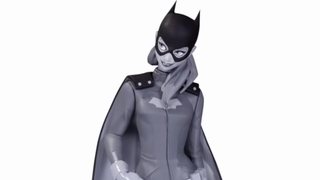 Good News: New Batgirl Statue! Bad News: It's not out until Fall 2015. Kinda-sorta news: It's part of DC's Black and White range, so it's not as bright and bold as Babs Tarr's glorious art for the ongoing adventures of Barbara Gordon, but hooray for new Batgirl design merch nonetheless! I love the new Batgirl, but I'm left umming and ahhing about this one - the sculpt is incredible, it looks like a spot on recreation of Tarr's style, but at the same time this being Batgirl's first entry into the Black and White line is kind of doing the style a disservice - what I've loved about the new run of Batgirl is its vibrancy, so while the Black and White version is certainly striking, it misses something without its bright, lovely colours. But also Fall 2015!? Noooo DC I can't wait that long! I really hope there's more in the way of merchandise for this incarnation of Barbara before then. I'd do some pretty terrible things for a DC Collectibles Batgirl figure. Alas, all we can do for now is sit and wait. At least there's the comic to enjoy while we do!